New Zealand's ruling Labour Party has won a slim victory in a general election, but will need the support of minor parties to form a government. 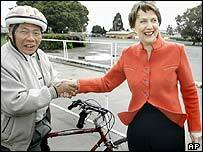 Prime Minister Helen Clark's party has won 50 seats in parliament - well short of a majority and just one seat ahead of the opposition National Party. Ms Clark has said she will negotiate with smaller parties to keep her government in office. But the National Party is set to try to forge its own coalition government. National Party leader Don Brash has refused to admit defeat, and said that in the coming days and weeks he would "endeavour to put together a National-led government". If Ms Clark is confirmed in office, she will be the first Labour leader since World War II to win three terms. "I've run a stable minority government for the last six years and I hope to form one again," Ms Clark said. During the campaign she appealed to voters by pointing out that her party has kept the economy in good shape. 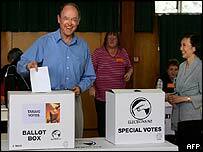 Mr Brash campaigned on a promise to strengthen trade ties with the US and scrap some welfare and voting rights enjoyed by New Zealand's native Maori people. Correspondents say Labour is more likely to be able to form a government. It already has the support of the Greens and the Progressive Party and can expect the backing of the indigenous Maori Party, whereas right-wing parties have not given wholehearted support to National. The BBC's Greg Ward in Auckland says the election has been marked by a remarkable performance by National. The party has doubled its vote after being torn apart at the last election, he says. The opposition leader has only been in parliament for three years, but has shaken up the establishment by vowing to soften New Zealand's ban on nuclear-powered vessels in its ports, and to discard some privileges for the Maori. He says the long-standing nuclear ban is stifling relations with the US, and its renegotiation could help with a free trade deal. Mr Brash has called for tax cuts, and the removal of seven seats reserved for Maori MPs and welfare policies aimed at the indigenous group. Saturday's voting was described as steady throughout the day, with poll officials saying turnout seemed stronger than in 2002 at the country's 2,700 polling stations. That year's 77% figure was considered low for the South Pacific nation, which has 2.83 million registered voters.